They don’t want you to generate your own power which makes solar technologies cool. I regularly get asked whether solar panels are worth it, and I just reply that 600,000 homes in only the United Kingdom alone have them on their roofs. Many installed solar panels to invest, but the vast majority of people I spoke to in the last decade, merely see trouble down the road for their children/grandchildren and want to invest in a better future. These are planetary sized issues that “we are truly all in it together”. Solar savvy people are just taking matters into their own hands, and I would go further and declare solar panels as a symbol of calm while the world’s politicians continue to blunder their way through the 21st-century. So compelling is the worldwide push for alternative technologies been, that it’s become a victim of its success. By encouraging green technology, despite the global problems we face, it’s viewed as a problem for the traditional energy industry. If you want to know how beneficial solar panels are to yourself the homeowner and detrimental to the dinosaur-burning energy industry, then you need to only look at some cases in the US. Some energy companies is threatening to disconnect solar pioneers who install solar panels to their home. It reminded of scared white politicians trying to ban hip-hop music in the 1980s. So uncool! This type of attempting to hold back the tide of progress, will ultimately fail as other savvy energy companies will actively embrace solar pioneers and thus benefit more from a longer-term relationship rather than the cup game of switching that is currently encouraged and ultimately has only short-term benefit for consumers. The bigger picture shows that Saudi Arabia has admitted to reducing the cost of oil to make alternative energy sources expensive by comparison and to shut down green development (at which point the price of oil will increase again). The whole point about renewable energy is to look at the longer-term, and if you’re a Chancellor of the Exchequer with family interests in keeping the status quo, then your decisions are likely to be tainted anyway. These prolific attacks on alternative energy technologies should be an incentive for you to pursue as your full dependence on their energy network becomes their power over you and mass adoption will erode that power they hold over us. And they know it! Additionally, anyone who disagrees with Saudi Arabia’s kingdom of terror, should install solar panels. Anyone who hates with Russia’s hardline anti-gay politics should seriously consider them, and anyone whose consciousness loathes the barbaric world of ISIS can fight back by adopting technology that can negatively influence their black market oil-based economy. Unfortunately, the global push for a greener based economy has become a victim of its success; by encouraging more installations the people who have interests in keeping you ‘dependent’ on ‘burning every last available hydrocarbon’ care not for you, your family or their future – only their offshore accounts. Forgetting the financial implications of adopting solar panels, every mother, father, grandparent and even self-confessed ‘Penny Pincher’ will see long-term benefits. Solar panels are worth it and as a result, have made enemies here and abroad. Even more, reasons to join the solar panel revolution are electricity costs (no taxes & no network costs) are around 16 Euro cents (source: Eurostat) – is the highest in Europe – The rest goes to the energy companies. Fast financial footwork on the part of the ‘big six’ except SSE, all the big six are non-UK based. Wholesale prices in the UK are the highest in Europe (source Tennet) roughly double those on Nordpool. These points to price fixing by our foreign owned energy companies. In reality, energy companies should be forced to provide us with clean energy. Not the taxpayer, but our political system controlled by corporations and not vice versa. Subsidies for coal, oil and gas could easily be diverted toward clean energy, increasing year on year, but your household is nothing more than a cash cow, and herded or switched between fields to give you the ‘illusion’ of choice. Real ‘consumer power’ comes from putting solar panels on your roof and genuinely becoming less reliant on the current corrupted network. The government spends far more money on subsidies for the search for dead dinosaurs and with the same breath attacks alternative energy for requiring subsidies to compete – a cleaner, decentralised energy economy is not what they want for you. Do you? To get inside the mind of a solar panel pioneer, you must be able to see the world for how it is and not how they tell you it is. Only then, will the question of ‘is solar panel technology worth it?’ – then seem a ridiculous one to ask when looking at the bigger picture. Humanity is in denial. I love the concept of solar technology because of its global potential to drastically change our civilisation for the better in a brief period. To follow any other path will undoubtedly leave us in a desperate spiral downwards as burning dead dinosaurs now proves to be very short-term thinking in a long-term game of national and planetary survival. We are in a ridiculous situation where our government has to give subsidies to foreign energy companies who then profit from us all, and then the cycle begins again. The national transition to alternative technologies should have been paid by the 80s and 90s North Sea oil and gas bonanza. Thirty years later and we’re back to square one looking for the next big fix. We are coming to a point where there is very little wriggle room in the planetary system. World surpluses are disappearing and in most cases gone. Global drought-stricken food supply, water, including ground-water availability and even the global weather systems are close to tugging us over into the negative margins of tolerances. Our ability to extract and our ability to burn dead dinosaurs is only measured in decades at the very most! This view is scary if you have loved ones under 70 years old! The truth always comes out, even if eventually and today we now learn that ExxonMobile has known and funded denial lobbyists for at least 27 years. That in itself should be an incentive to divest your annual household energy expense into becoming less dependent on dead dinosaurs to help prevent our self-inflicted extinction event. The only important thing is that you enjoy life and try to make the planet we live in, a more habitable place for our children. I’m afraid, from a theological, a survivalist and custodian viewpoint, to date the modern human race is a bitter failure on all counts. The withholding of the true nature of our existence is killing our civilisation, our future as a species and the planet. The truth of our precarious position now hidden in plain sight, but the distraction techniques deployed by manipulative corporations prove to be too good for most people – television is your enemy. Humanity has been worshipping the sun for aeons, but if we are to survive long-term as not just a civilisation, but a planet capable of sustaining complex ecosystems, then we must once again learn to put the sun at the centre of our universe. And that’s why I think solar panels are fresh and the use of dead dinosaurs belong in our history. 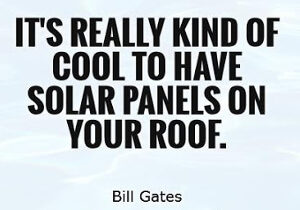 Bill Gates may not be the most significant symbol of cool, but he knows right technology when he sees it. Hip-hop flourished despite a political effort to stamp it out and so will solar panels.